Imagine an active eight-year-old boy playing baseball, basketball, and tennis … going nonstop. Now, imagine that same boy hindered with difficulty breathing ― something most of us take for granted. That was me, diagnosed with asthma and immediately put on all types of medication. The meds made me feel jittery and not “right.” I tried my best to not let the asthma or drugs slow me down, but it was difficult. In college, I was placed on “better” medications and given a “rescue” inhaler, which I used consistently. In addition, a severe case of eczema developed on many parts of my body. Many trips to the doctor and expensive lotions didn’t help. Still active, I took up running but could go for only a few miles at a time. Inspired by a coworker, I decided to train for a marathon and in 2008 completed it with a time of 3:51:17. I got the “running bug” and began to train more seriously. In addition, I started studying nutrition and paying close attention to what was working best for my performance and recovery. After reading an article about eliminating red meat from my diet, I tried it, and gradually moved to a vegetarian diet. 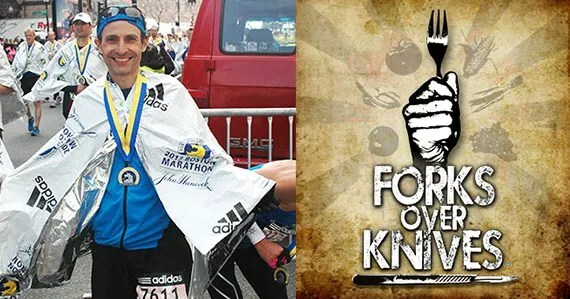 In 2011, I saw a trailer for the Forks Over Knives documentary and knew I had to see it. One day, in the middle of the workday, I checked the movie listings and saw that it was playing in my area. At that moment I felt compelled to see the movie and dropped everything that afternoon to do so. After seeing Forks Over Knives, I decided to try the plant-based diet approach. Within a short period of time, I noticed my asthma and eczema symptoms were not as prevalent as they had been. Working with my allergist and nutritionist, I reduced the medication and eventually stopped taking medications altogether. For 33 years I had taken medication every day ― this was a life transforming event for me! And, while this was all going on, I continued to train and run marathons. After moving to a plant-based diet, I noticed my performance and recovery times improved significantly, and I was able to reach one of my goals: qualifying for the Boston Marathon. To date, I’ve run 14 marathons and qualified for four Boston Marathons, running in two of them (including 2013, where I finished ahead of the bombing). The NBC affiliate in Detroit has a health segment and featured my story earlier this year. I’ve never been more active or felt better. Each day I’m amazed that I no longer take medication and that my eczema is completely gone! Posted on June 17, 2014 by Health and Food MattersPosted in Articles, HealthTagged health.